Modern style in the interior is called “cozy minimalism.” And such a name of the concept of residential premises’ arrangement has appeared not without purpose – inspired by minimalism love of bright and spacious rooms, the simplicity in the arrangement of space and furniture and an almost complete absence of decoration has received a new incarnation. In contrast to the minimalism in its pure, modern style advocates the creation of the most comfortable interior that will not “push” the owner, and will be functional, practical, comfortable and at the same time visually appealing place to stay. Less is better – this slogan can also be applied to the modern style. High-quality materials, the attraction to the naturalness, the use of original design furniture models and a few of decor – all this helps to create a simple in appearance but attractive by its functionality and a comfortability setting. Modern style is flexible in its manifestation – there are no clear dogmas and taboos. It is enough to understand the basic idea, the concept of design space and manage to “settle” it effectively in your home. To catch the current trend is not difficult; it does not restrict the fancy of decorators. It is easily combined with other stylistic directions: the style of Hi-tech, Art Deco, Art Nouveau, and even Loft. 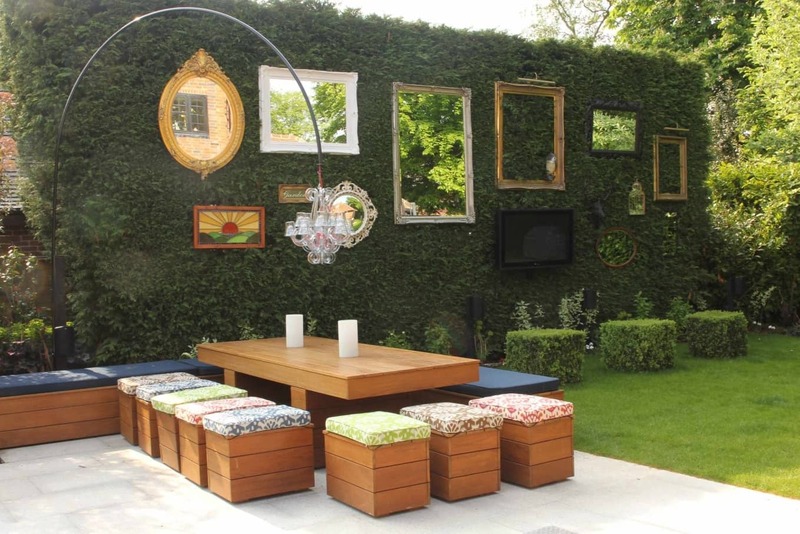 Alignment with the fashion trends, the use of designer`s furniture, original lighting, modern artwork. 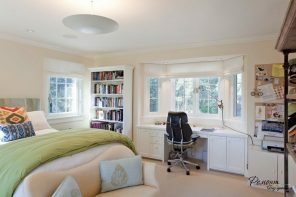 For the interior of the bedroom, which is the subject of this publication, many of the commonly used methods of space decoration in a modern style are not suitable. For example, it is difficult to imagine sleeping area, located on the south side of the building, without heavy curtains on the windows. Also, it becomes uncomfortable to see room with bare floors and with no heating system. Many features of the style are interpreted according to the personal needs of the customer, mutate without affecting the overall concept of modern style. Designers and homeowners love the modern style for its ability to transform quickly. Change the image of the room is not difficult in the presence of a neutral color palette, monochromatic finish and a basic set of furniture. You can get a completely different atmosphere of the room, another space character design just by adding a beautiful and original chandelier, one bright piece of furniture, or simply placing a few colorful cushions in a recreation area. Perfectly smooth, white ceiling is versatile design option for any style of interior. Whether you use suspended or tensile structures or will you paint the plaster to achieve this effect – ultimately, it does not matter. The main thing is to create the effect bright and airy space, visually increase it. The snow-white ceiling with light stucco on the perimeter, and possibly in the center around the luxury chandeliers is a feature of a modern interior. 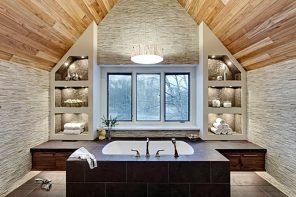 This design of the ceiling coating is combined with a simple one-color trim of the walls and floors lined with a wooden plank or effectively simulating it laminate. Another alternative design of the ceiling is not using stucco, bit its picture. Photoprint on a tension ceiling in bright colors can be a highlight of your neutral bedroom interior. Manifestation of luxury for the modern style is not a priority. So if you want to use expensive embossed wallpaper, supplementing it with fancy moldings and relief, you can confine using such a finish only for one accent wall, leaving the rest of the planes in monochrome, neutral design. Modern style advocates the use of neutral colors in interior decoration. That is why all shades of gray are so popular – from the color of wet asphalt to the silver, giving the interior calm elegance and restraint. The use of such design techniques as the accent wall is relevant to this day. 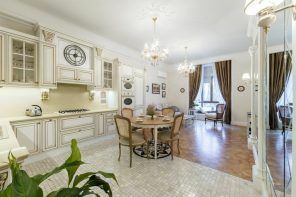 To highlight one of the surfaces of the room, you can use a variety of means – from a simple painting at distinct from the rest of the trim color and up to use of expensive wallpaper with geometric pattern, lining the surface with the help of wall plates (mostly wood) or decorative plaster. The most widespread are accent walls of monochromatic embodiment. Easy finishing and subsequent mixing with pieces of furniture and a few decorations attract both designers and their clients. If you decide to use print as an accent to highlight one of the walls of the bedroom, stop your choice on a geometric figure or abstraction. For example, the stripes are becoming used again for visual expanding the space. 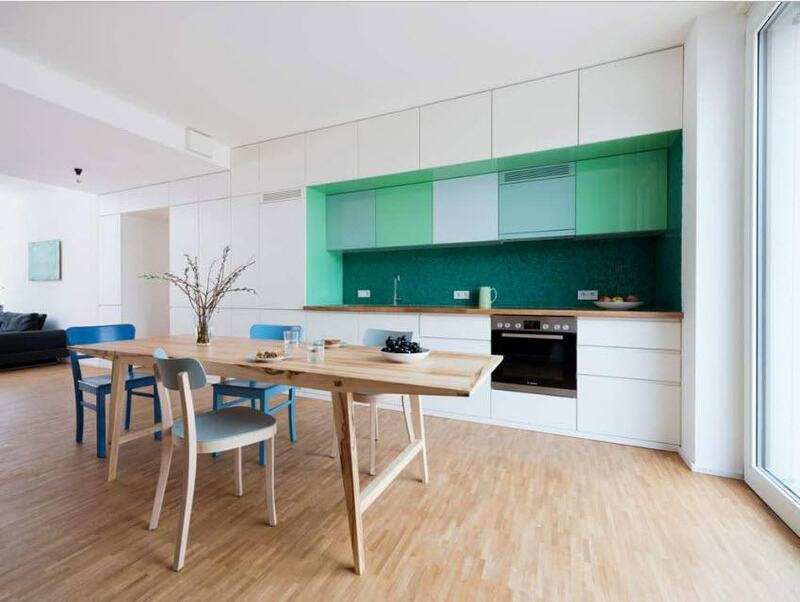 The horizontal strip visually increases the width of the room; vertical one increases its height. The use of floral motifs in the decoration of one of the bedroom walls is a bold but justified step. 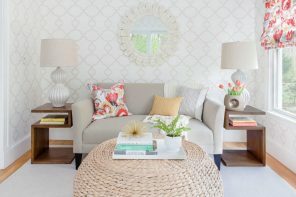 In case you use too colorful and motley decoration of accent walls, other surfaces and even furniture should be performed in a neutral, light-colored palette. The easiest way to “support” colors of accent wall is by color of the textile at berth or window openings design. The snow-white bedroom will always be in the trend. Therefore, the use of white for the trim of not only ceiling but the walls will be an excellent basis for the construction of the entire interior. The white walls of the bedroom are a clean sheet for the formation of the atmosphere, the background for any furniture and decor. But absolutely white bedroom – that is an extreme. Contrary to expectations of calm, peaceful environment, you can get a stable association with a sterile operating room. Just a couple of paintings or big family photos on the walls can dilute a snow-white idyll and create much-needed accent for our eyes. If you are worried about the brightness of artistic canvases, then hang it over the headboard. 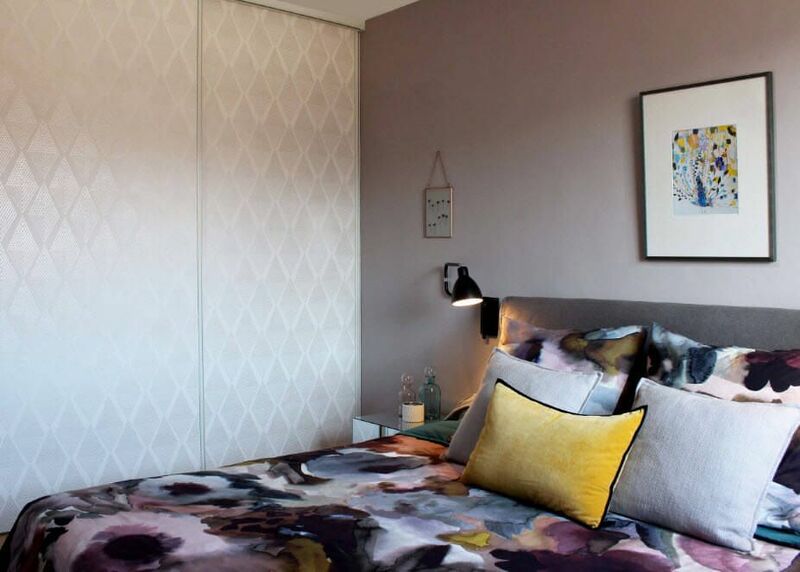 Paintings in pastel colors can be placed on other walls. It all depends on what you want to see first when you wake up and the last before retiring. Imitation of a bricklaying or painting in a light tone of real walls not undergone plastering is one of design techniques, which remains relevant for many years. Even partial use of decoration in the form of brickwork – at the headboard or one of the perpendicular walls can bring a bit of loft style brutality to your modern interior. Modern style is not alien to the game of contrasts in the formation of conditions of the sleeping room. Just a couple of contrasting colors is able to form the basis for drawing up the interior. Of course, in most cases light tone is selected for walls, and pieces of furniture and decor appear as dark spots. But the reverse version of blending is possible in areas with large and medium size. Interior with dark walls looks not only contrasting but even a little dramatic, mysterious. Natural wood is ideal for the execution of flooring in the interior of any style and Modern was no exception. Floor board or parquet blend perfectly with any kind of walls, and look great with most of the variations on the theme of furniture collections. 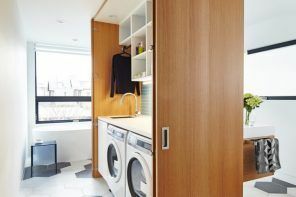 But the natural wood is not every homeowner can afford, so showy counterparts become the best alternative. Contemporary laminate perfectly simulates different types of wood, easy to install and fairly democratic cost. Sleeping space becomes more comfortable if the floor top would be carpeted. Soft nap will pleasantly warm bare feet before the bedtime and give a pleasant feeling immediately upon waking in the morning. But forget about the rugs with oriental motifs – only one-color carpet with a long nap or a geometric pattern, but in combination with a monochromatic finish. How to Choose a Kitchen Sink to Fit the Interior?